The following is a general outline of my trading rules. I primarily watch the index futures. My method is easily learn-able on these platforms and can be then applied to other markets. At the core of the TradingFibz strategy are the combinations of exponential moving averages and Heikin Ashi candles to keep you in the TREND as long as possible. Fibonacci Patterns, Murray Math Levels and market internal studies may be used as supplemental support when in the trend. A stop should always be used and contracts taken off along the way with a stop moved to break even to ensure a no loss setup. Major economic data? FOMC minutes? Best to sometimes wait for econ data and 25m Open Range to setup. Price action that moves above or below the range tends to be a momentum drive. This does not mean I will wait for price to move above or below, it simply is an indicator for a stronger trend move. 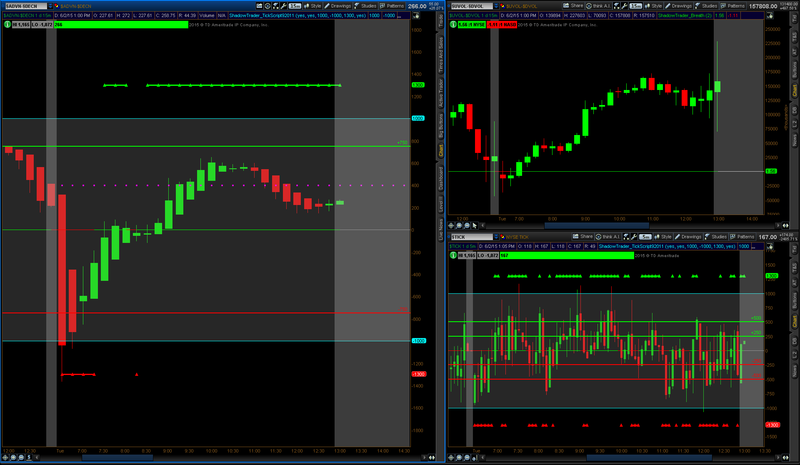 The 25m Open Range many times serves as a support or resistance. This setup may occur at anytime between US regular trading hours market open and close. Price action in trend below the 50/144ema cloud (option: T3-5 or 10 and/or 50ema on chart) and 5/34ema in sync. Price reversal would be all indicators upside with price above the cloud. Once setup is present, confirmation is evaluated on market internals. Seen below on the posted chart, same as above on the core setup and termed as “ALL charts in sync” (5/34ema, 50/144ema in sync). Price above or below the cloud? Is price above/below the T3-5 or 10? If unable to plot a T3 moving average, substitute with a standard exponential moving average study with the same period. To remain in trade, option to use the Heikin Ashi bars (or any TREND bar study) to keep you in the trade. 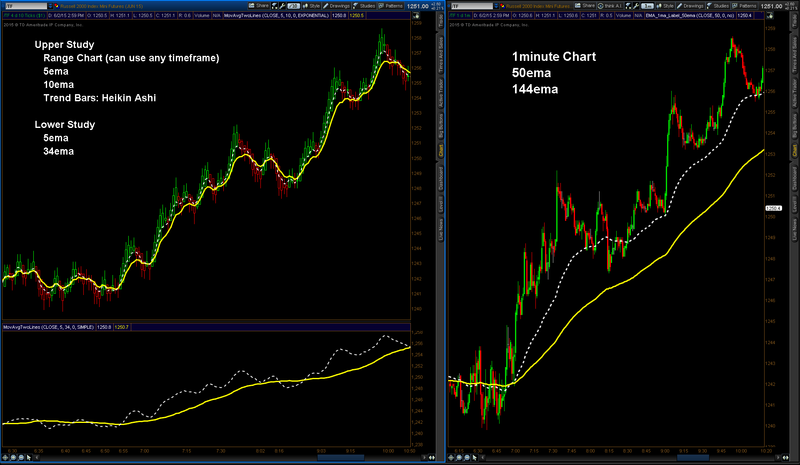 If using the combo MML charts, regular trading hours setting is 5 or 10m and during globex a 1-2m chart. AD Line – near the pivot, zero or 750 line? Manage the trade in TREND with movement of Stop. ***Multiple trade exit strategies covered in the e-Manual and Live trading room. Daily Pivot lines with R1/Pivot/S1 identified. David, was the e-book and trade room put on hold? Would love to be a part of it. E-manual moving like molasses. Trading room up and running. Free on Thursday’s. Hello, I’m a bit slow on uptake. How do I order (pay) for your e-manual? Once it’s done, paypal button will be available, Thank you,. Link is provided for members. I am new to trading and looking to learn from your research and exp. How to join?